Stacy Bare gets an moment of awe rowing into Echo Park on the Green River. Bare believes outdoor therapy should be embraced by the medical community and insurance industry. When: Thursday, 6 p.m., doors open at 5:30 p.m.
After learning firsthand how the wow factor of the great outdoors can save a life, Iraqi war veteran Stacy Bare hopes to show that nature is essential medicine when dealing with many of society’s ills. Bare is a leading foot soldier in the effort to assemble a mountain of evidence from scientific studies to show the value of outdoor therapy to ease stress and improve mental as well as physical health. Bare is a former Army captain who received a Bronze Star for his service in Iraq from 2006-07. But when he came back to the United States he said he felt insulated from the people and institutions he knew. A tall, powerful man, Bare became a grade-A partier. Cocaine and alcohol were his substances of choice. He recalls playing a game where he would tear into an 8-ball of cocaine, then try to smash through a wall while on the energized high. Another veteran invited Bare to go rock climbing in Boulder one day in 2010 before he either died from partying or took his own life. Bare saw the light. He channeled his energy into the wild instead of the wild life. He is now director of Sierra Club Outdoors, what he considers the “heart and soul” of the national conservation group. The program strives to get people outdoors — not just on grand tours of the Rocky Mountains, but into the parks of their communities and even their backyards. “We live in a really beautiful country. I’ve never been to a state where I haven’t seen beauty in the outdoors,” Bare said. “It might be the boulevards in the streets that are really well taken care of, it might be a great city park, it might be the rolling plains of eastern South Dakota or the Flint Hills of Kansas. There’s just a lot of beauty out there. “One of the things we need to do is really make sure when we’re talking about the beauty and time outdoors we’re not just talking about big dramatic mountains or desert rivers or big Western rivers. Once people are outdoors, they will discover their own “wow” moments. Bare believes that will lead to better overall health and well-being. He helped found the Great Outdoor Lab, which undertakes research to try to demonstrate the benefits of outside. The goal is to persuade the medical community and insurance industry that prescribing activities outdoors, and paying for them, is beneficial. Bare said an article making its way through the peer-review process shows a 27 percent decline in post-traumatic stress symptoms from the baseline level and a 19 percent overall reduction in stress from activity in the outdoors. It’s a field that is getting lots of attention. 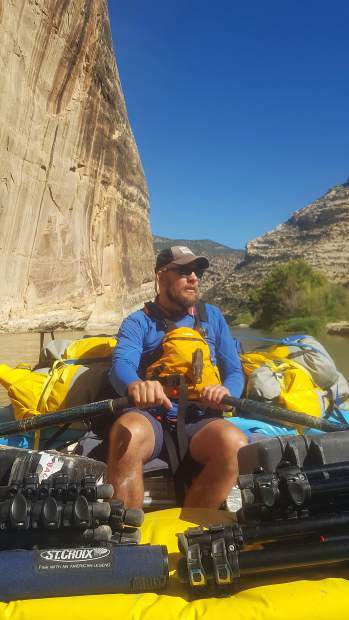 Many groups understand the importance of using the outdoors to help veterans or other people affected by trauma cope with their psychological and physical wounds. Huts for Vets and Challenge Aspen Military Opportunities, for example, get veterans hiking into the backcountry or experiencing the joy of fly-fishing or skiing. Several studies are underway along with the one by the Great Outdoor Lab. Bare is enthusiastic about the potential of the studies to help shape policy. So maybe in addition to receiving a rec benefit from an employer, an insurer sometime in the future will provide payment to seek a specialized trainer or gear for outdoor activities. They will realize that a healthy and fit customer is less expensive than one struggling with substance abuse, stress and even suicide.